The ScharkSpark Drone Guard is one of the best camera drone for beginners. Just as the name suggests, this drone is designed with the needs of a beginner pilot in mind. It is equipped with all the features that make it easy for a novice to pilot to enjoy the flying experience. The rugged, robust construction with hardy material ensures that it can withstand mishandling and abuse. Such is bound to happen with beginner users. This is a camera drone. You can capture photos and videos of your moments with it. This is quite an admirable feature. 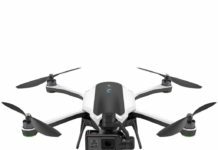 Most beginner drones in its range do not come with a camera. In this ScharkSpark Drone Guard review, you will see more of its features. The ScharkSpark Drone Guard comes in a modern and elegant design that gives it a graceful appearance. It has a tough hull body that features a blend of sleek black and gold colors. All parts are made from high-grade materials that make them sturdy and durable. It is quite compact and to make it even more compact, it has foldable rotor arms. 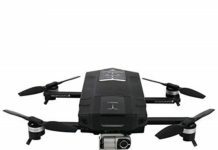 Another unique thing that you will notice about this drone is that the power button is conveniently located on the top side of the body, which makes it very easy to power on the quadcopter. The compact and lightweight design makes it easy for you to pack and travel with this drone. It can easily fit in your backpack pockets. When folded, it only measures 4 by 4 inches and weighs 0.39 lbs only. In addition, due to its smaller size, you do not need to get FAA registration to fly it. You will also get an extra set of propellers just in case you break one and have to replace it. To make you night flights easier and enjoyable, the ScharkSpark Drone Guard has been designed with bright LED lights. As earlier noted this drone comes with a camera that enables you to capture videos and pictures of your flight. You can also use the Wi-Fi feature to stream live videos direct to your iOS or android device. You will enjoy a first person view within the Wi-Fi transmission range of approximately 30 meters. The first person view enables you to feel as if you are right inside your drone because you are able to see exactly what it is seeing in real time. This drone comes with not one, but two 3.7V 1000mAh Li-Po batteries that provide you with about 10-12 minutes of flight time for one battery. 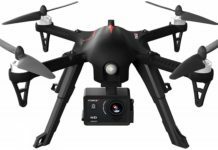 That is higher than most drones in this price range offer. With the two batteries, you can have an extended flight time of about 20-24 minutes and each battery takes about 90 minutes to be fully charged. About the flight performance, this drone flies smoothly and professionally. First, it is extremely easy to fly and control. It only has a single take off / landing button. A simple touch of the button and you will be able to fly or land your drone. This drone is also incredibly stable in the air, courtesy of the inbuilt 6-axis gyro stabilization mechanism. This system is able to detect any changes in the air pressure, adjusting your drone accordingly. It makes it quite easy for newbie pilots who are learning how to fly a drone. They can enjoy the experience without focusing too much on the drone’s stability and movement. The stabilization system also enables the drone to perform 360-degree flips so smoothly and gracefully while in the air. 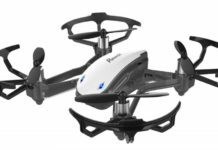 The one feature that both the novices and advanced pilots will love about this quadcopter is that it is equipped with an altitude hold feature. This feature is activated by releasing the left throttle. It enables the drone to hover at a desired height so you can take photos from there. This allows easier maneuverability of the drone, enhances flight stability and enables the drone to take clearer aerial photos. 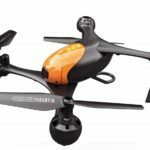 This best camera drone for beginners also has the headless mode feature, which further makes it easier for the beginners and other pilots to fly it. When headless mode is activated, the drone will respond to the controller’s location regardless of what direction the nose is facing. 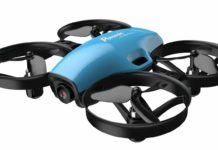 To ensure that pilots of all skill levels enjoy flying this drone, it comes with three speed levels that suit beginner, intermediate and the experienced pilots. Losing a drone when it flies out of range is a common challenge with many beginner drones. However, the manufacturer of this drone has ensured that you will never lose your drone this way by incorporating a Return Home Key. If your drone flies out of sight or loses signal, with a single press of this key you be able to return your drone safely to the take off point. Controlling this drone is easy courtesy of the easy to maneuver controller/transmitter. All the functions are well labeled and easy to understand. The joysticks are also highly responsive it comes with a handy phone holder. With this transmitter, you will be able to control your drone within a range of approximately 80 meters. 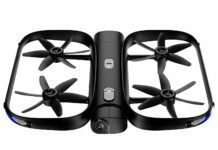 This is a very compact drone, which makes it very easy to fly it in both indoor and outdoor settings. Mike P.
I bought this drone as a gift to my 12-year old son and he absolutely adores it. It is very easy to fly, control and maneuver. In addition, it is tough, durable and inexpensive. He loves flying it every weekend. Marie Carla. This drone is very easy and fun to fly. I love that it is sold with an extra battery so I can keep on flying it as the first one charges. I will keep this drone in my collection for a long time. Zack B. Who Should Buy the ScharkSpark Drone Guard? 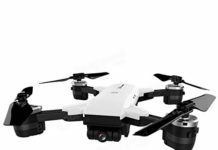 This drone is particularly ideal for newbies who are looking forward to becoming seasoned drone pilots in future. It is loaded with all the features that a beginner needs to learn how to fly a drone. 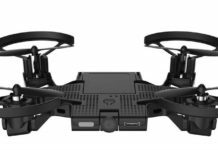 It is also a good choice for the intermediate and skilled pilots who would like to own a mini drone for fun since it also has some features that ensure that they also enjoy the experience. The ScharkSpark Drone Guard for beginners is a high quality and reliable drone. It is designed to be easy to use, with durability in mind. It is incredibly stable while on flight. It comes with a wide range of features that are mostly found in the big boys of the drone world. If you are looking for the best camera drone for beginners, this is it. It is also good for children as you initiate them to the world of drones.